Planks II Pre order is now CLOSED. Estimated delivery date is 11 June, I already have panels so they will ship after that. Do you happen to have black panels? I avoided the first one in favor of the full-size Frames, because of playability issues. This one seems like a much better physical UI, so hopefully it'll sell better. I wonder if the slider potentiometers are more susceptible to dead spots/wear than knob pots. I'm getting one 100%, customs be damned. Been waiting for these since I saw 'em on reddit. They are absolutely stunning and I hope they will be come a standard in the DIY community. Absolutely lovely design. I'm really curious what would Olivier's opinion be about the UI. Obviously he made his based around the control knob, but I think the difference in focus here is justified. 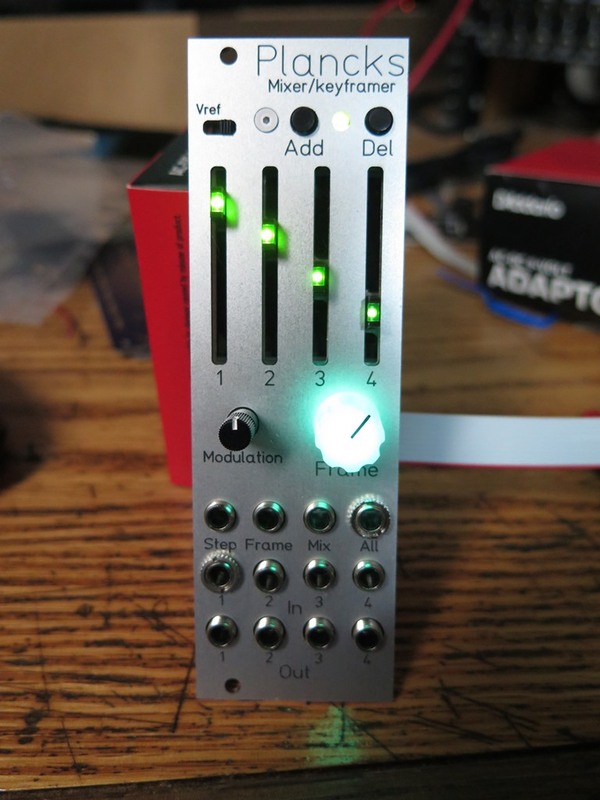 This is the only one of the µ modules that stands on its own as a good panel design IMO. The big knob is a loss, but the only real compromise (and it's a small one) is that the 'Mix' and 'All' jacks aren't grouped with the Ins and Outs. Ok, that sounds like critical mass reached. I'll contact everyone individually here and do a preorder listing in FS/ST. How long are pre-orders open? Yes, the LEDs on the sliders fade like the LEDs on Frames. Still possible to preorder (a bit late right now I know)? I see Plancks II PCBs on the website, but no panel. I've love to place an order for both. Ok, all preorders have shipped and parts are in stock. yasssssssss. i got my tracking number wooooooo. me too! i assume it's loaded with latest firmware? was planning on adding parasites if it's not default. me too! i assume it's loaded with latest firmware? was planning on adding parasites if it's not.